Mac Hill, former member of Cub Scout Pack 185 (Pine County, MN), died on Thursday, October 23 in a heartbreaking accident. He was an active member of our Pack at the Audubon Center of the North Woods before changing schools, when schedule conflicts intervened, but we kept in touch. 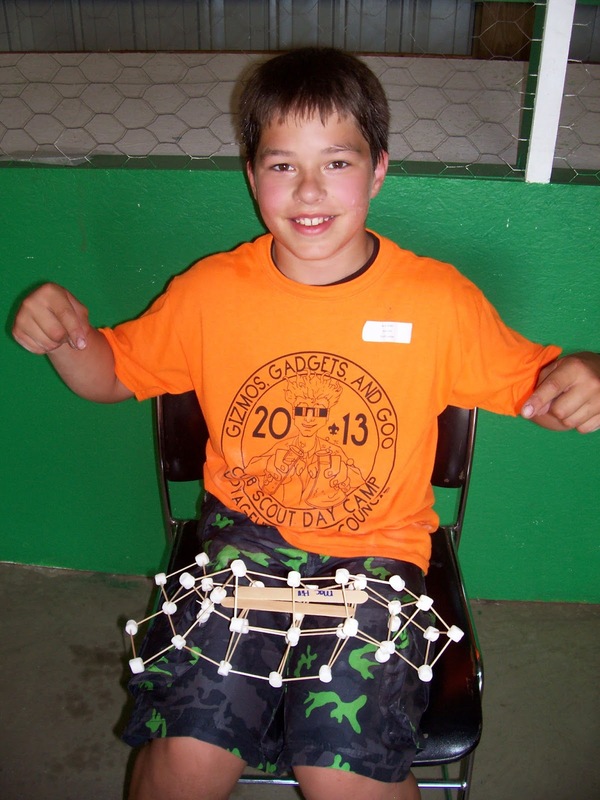 Here you see him showing off his design for a bridge made of marshmallows and toothpicks at the "Gizmos, Gadgets, and Goo" STEM-themed Cub Scout Day Camp in Barnum, MN in 2013. He also did a great job of designing a container for the camp egg drop that year -- it survived the fall from the top of the grandstand just fine! Mac was a great kid and will be deeply missed by all of us. Please keep Mac's family in your prayers. And feel free to share this post. 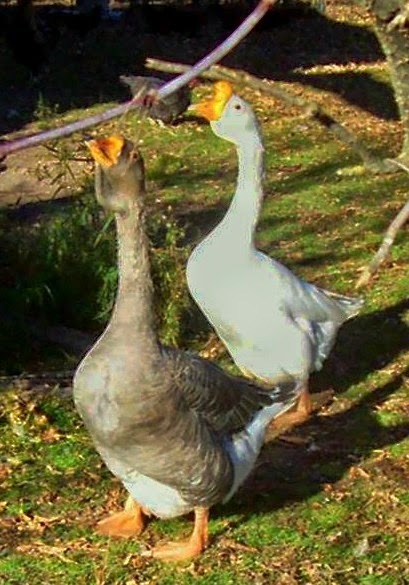 With geese, the ganders help care for the young. Since Prince no longer has a mate and there are no goslings around, he has turned his affections toward my guineas. From the moment I brought home four half-grown guineas last fall, he has taken a most paternal instinct toward them. When they first arrived, I had to keep them in a cage inside the coop for a couple weeks before letting them free range -- otherwise they would try to "home" back to where they came from -- and Prince stood guard by the cage every night. When I finally did let them loose, he followed them around the yard. Junior went along, but it was primarily Prince who set the pace. And he made sure they went back in the coop, too. If they tried roosting in a tree, he stood at the bottom and raised a ruckus! By the time the first snow came, they were well trained to go inside. The guineas turned out to be three males and a female. I really had no intention of breeding her, but she had other ideas. Her first nest she built too close to the road for comfort. Prince was having a fit because the road is his boundary and the males were going across it to my neighbor's yard. That's how I found the nest. I took the eggs before she started setting, hoping that would be the end of it. So what did she do? 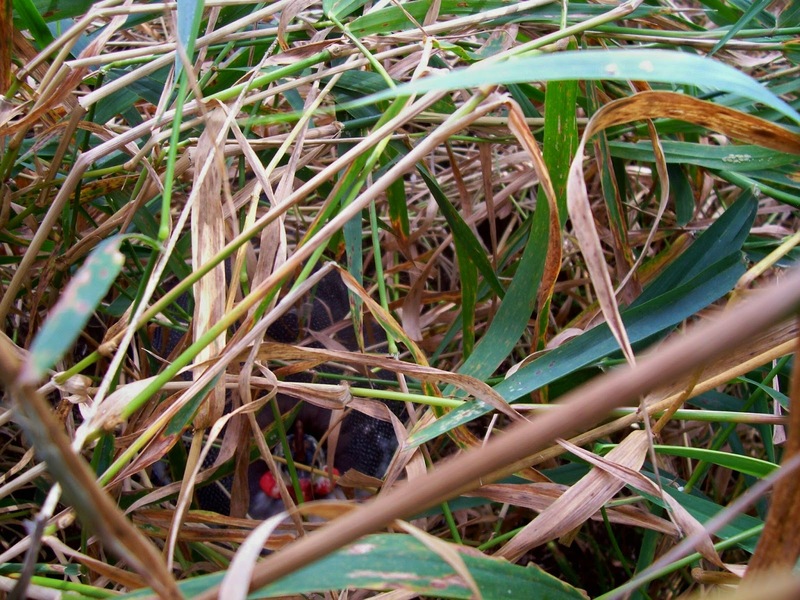 She hid her second nest closer to the coop in the tall grass. I didn't find this one until she was incubating, so I let her be. If you look really, really closely in the photo, you can see her in there. That brave bird sat through two very strong rainstorms and held fast to her eggs -- I thought for sure I'd find her drowned the second time, when high winds brought four inches of rain within hours. But she built well, on top of a little rise, earning her the name "Molly Brown" (of Titanic fame, since both survived dangerous waters.) Why didn't I move her inside? Because moving a guinea nest is very risky. They are wild, flighty birds who often abandon the eggs if disturbed. Better to leave nature alone. There were 15 eggs. 12 hatched but one baby died, leaving 11. I wasn't sure exactly when she started sitting, so I checked every day. 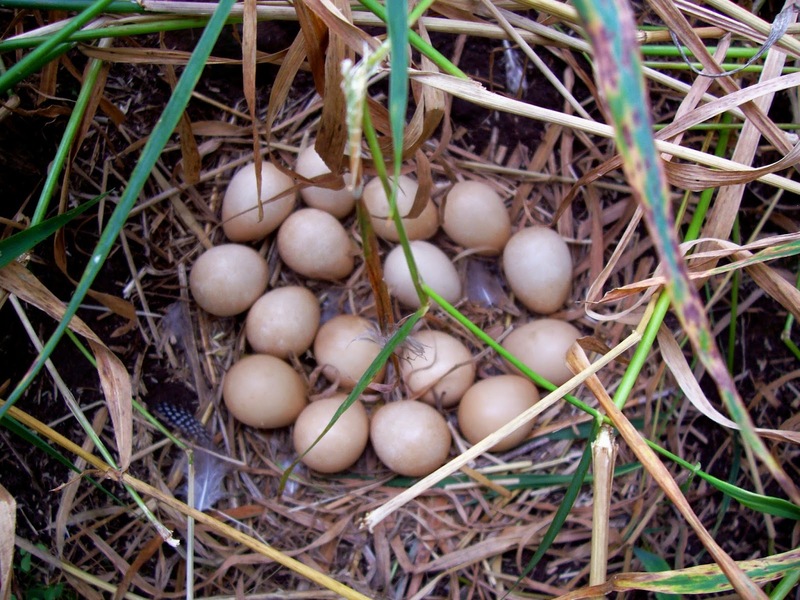 Luckily I found them right after hatching, because the grass is cold and wet in the morning this late in the year. 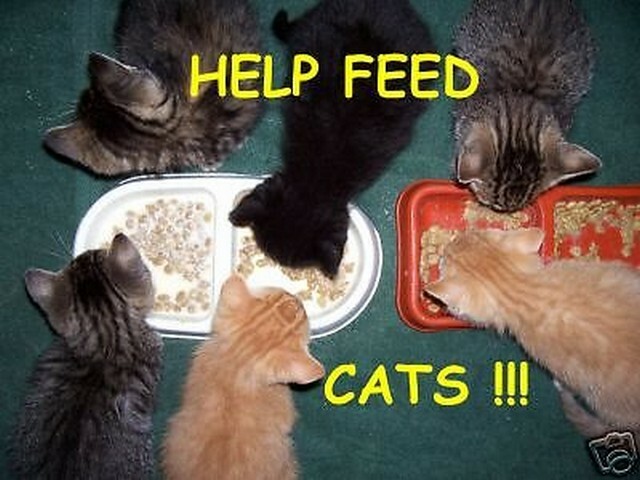 That can mean death to new keets. So I caught them all with mother Molly and put them in a large cage inside. Prince stood by them outside the cage, often not even wanting to come outside the coop. 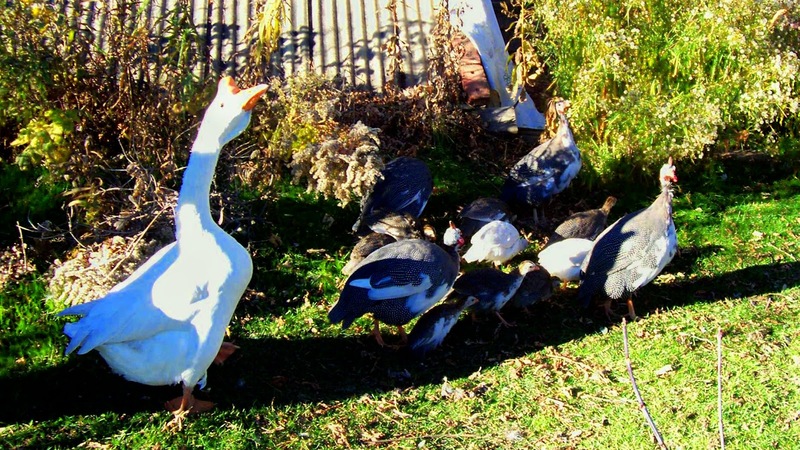 When they were feathered out and big enough, I turned them loose -- and here you can see both ganders herding the flock around the yard! 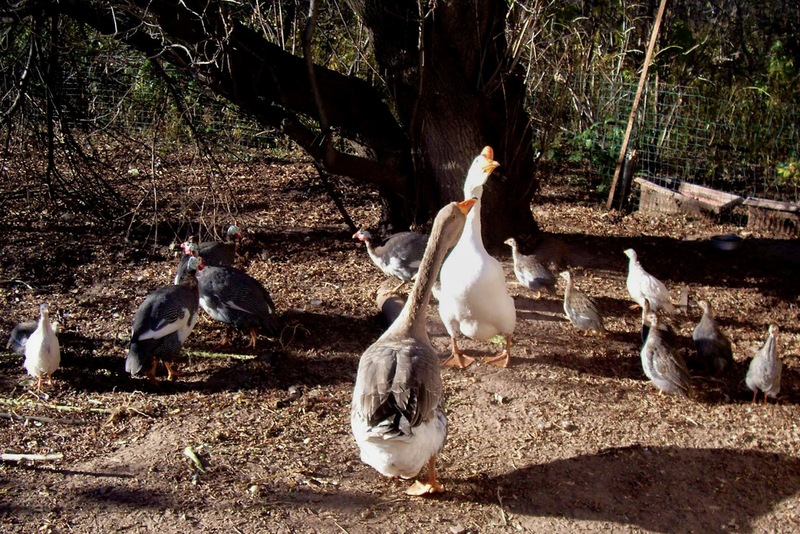 Prince herds the flock home toward evening, fall 2014.
in the chicken yard, fall 2014. Tonight the Festival of Sukkot (booths) begins. Because the Jewish calendar is lunar, Sukkot always begins on a full moon. So nothing unusual about that. 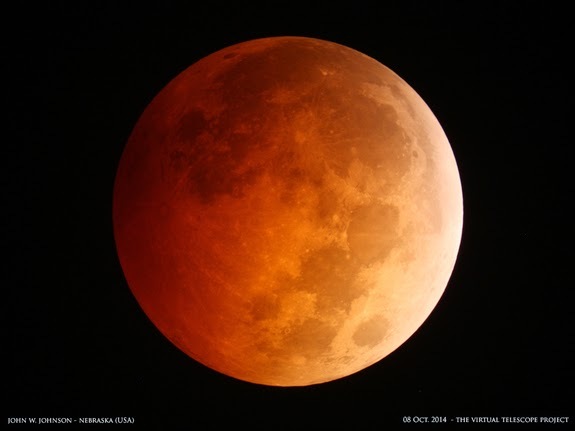 What was special this year was the beautiful "blood moon" eclipse this morning (October 8, 2014). It reached totality at 5:55 AM here in Minnesota, and is currently trending all over the Net. In some places, people gathered for "blood moon parties" to watch and enjoy it. That would have been fun, but out here in rural Minnesota, it was a solitary experience for me. Here on our little hobby farm, I was up at 4 AM cooking food for the Festival so that I could use the daylight hours to finish setting up my sukkah booth. The local news stations were covering the eclipse, so every half hour or so there was a live update during the weather report. We live out of town on a dirt road with zero traffic this time of night, so I could stand there moon gazing, but it was also pretty cold -- in the mid 30s -- so I didn't stay out long. In fact, it was so chilly that there were no crickets chirping. Nor were there any other nature sounds. The wind, which had been blowing hard the last few days, was now still. No traffic sounds, either -- even the freeway, which I can sometimes faintly hear at night if a noisy truck goes by, was silent. Then, for some reason known only to himself, one of my roosters crowed. According to an old superstition, a rooster crowing at night is a bad omen. So is a blood moon in some cultures. 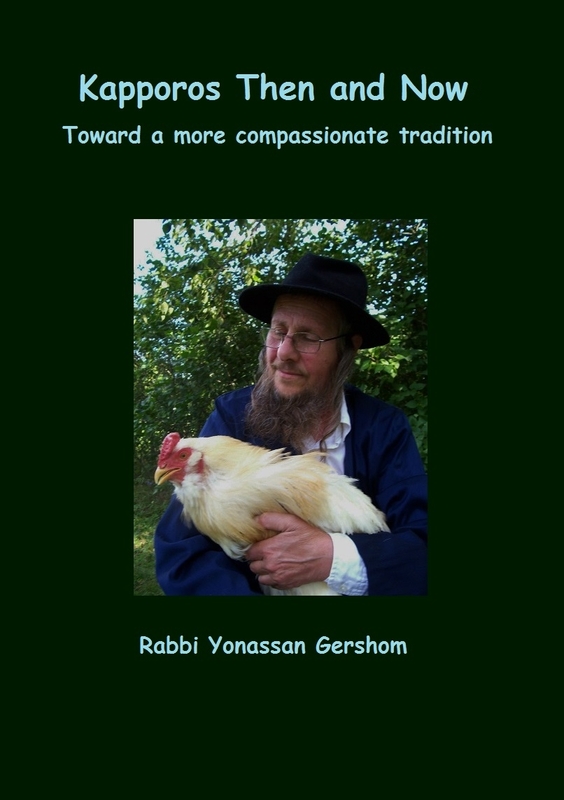 So a blood moon and a rooster crowing at the same time -- oy vey, is that a double whammy? 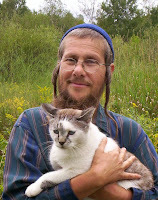 Returning to the eclipse, I did take time to make the brochah (blessing) osseh ma-asseh bereshit -- praising "The One (God) Who creates the works of Creation" -- that Jews are supposed to say upon seeing a wonder of nature. It may not be an omen, but it is a wonderful thing to look at. My wife, who has difficulty walking and some balance problems when walking in the dark, opted to stay inside. So I downloaded this beautiful photo on space.com taken in Nebraska by John W. Johnson of the Virtual Telescope Project. I set it up as the desktop wallpaper on the computer, where we can both enjoy it today, as we continue to prepare for the holiday tonight.